A Lambda authorizer (formerly known as a custom authorizer) is an API Gateway feature that uses a Lambda function to control access to your API. A Lambda authorizer is useful if you want to implement a custom authorization scheme that uses a bearer token authentication strategy such as OAuth or SAML, or that uses request parameters to determine the caller's identity. When a client makes a request to one of your API's methods, API Gateway calls your Lambda authorizer, which takes the caller's identity as input and returns an IAM policy as output. A token-based Lambda authorizer (also called a TOKEN authorizer) receives the caller's identity in a bearer token, such as a JSON Web Token (JWT) or an OAuth token. A request parameter-based Lambda authorizer (also called a REQUEST authorizer) receives the caller's identity in a combination of headers, query string parameters, stageVariables, and $context variables. It is possible to use an AWS Lambda function from an AWS account that is different from the one in which you created your Lambda authorizer function. For more information, see Configure a Cross-Account Lambda Authorizer. If you're already using Amazon Cognito User Pools to manage your user accounts, or if you're considering doing so, you may want to consider using an Amazon Cognito user pool as the authorizer for your API, instead of a Lambda authorizer. For WebSocket APIs, only request parameter-based authorizers are supported. The following diagram illustrates the authorization workflow for Lambda authorizers. The client calls a method on an API Gateway API method, passing a bearer token or request parameters. API Gateway checks whether a Lambda authorizer is configured for the method. If it is, API Gateway calls the Lambda function. Calling out to an OAuth provider to get an OAuth access token. Calling out to a SAML provider to get a SAML assertion. Generating an IAM policy based on the request parameter values. Retrieving credentials from a database. If the call succeeds, the Lambda function grants access by returning an output object containing at least an IAM policy and a principal identifier. API Gateway evaluates the policy. If access is denied, API Gateway returns a suitable HTTP status code, such as 403 ACCESS_DENIED. If access is allowed, API Gateway executes the method. If caching is enabled in the authorizer settings, API Gateway also caches the policy so that the Lambda authorizer function doesn't need to be invoked again. Create the Lambda authorizer function in the Lambda console as described in Create an API Gateway Lambda Authorizer Function in the Lambda Console. You can use one of the blueprint examples as a starting point and customize the input and output as desired. Configure the Lambda function as an API Gateway authorizer and configure an API method to require it, as described in Configure a Lambda Authorizer Using the API Gateway Console. Alternatively, if you need a cross-account Lambda authorizer, see Configure a Cross-Account Lambda Authorizer. It is also possible to configure an authorizer by using the AWS CLI or an AWS SDK. See Configure a Lambda Authorizer Using the AWS CLI or an AWS SDK. Test your authorizer by using Postman as described in Call an API with API Gateway Lambda Authorizers. Before configuring a Lambda authorizer, you must first create the Lambda function that implements the logic to authorize and, if necessary, to authenticate the caller. The Lambda console provides a Python blueprint, which you can use by choosing Use a blueprint and choosing the api-gateway-authorizer-python blueprint. Otherwise, you'll want to use one of the blueprints in the awslabs GitHub repository as a starting point. For the example Lambda authorizer functions in this section, which don't call other services, you can use the built-in AWSLambdaBasicExecutionRole. 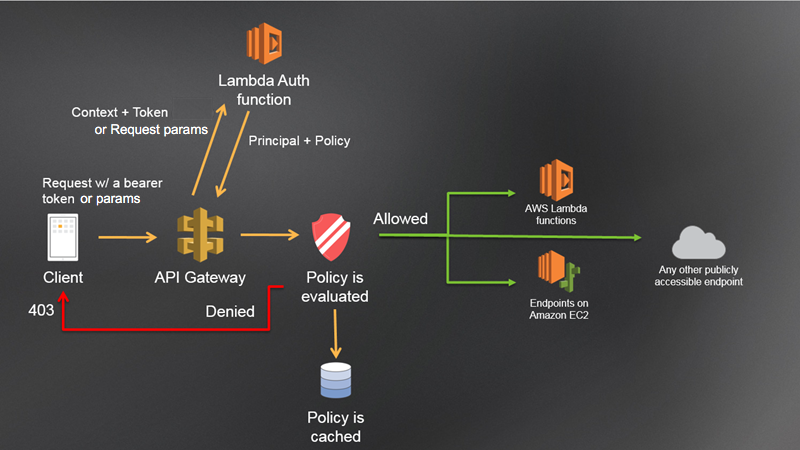 When creating the Lambda function for your own API Gateway Lambda authorizer, you'll need to assign an IAM execution role to the Lambda function if it calls other AWS services. To create the role, follow the instructions in AWS Lambda Execution Role. To create a token-based Lambda authorizer function, enter the following Node.js 8.10 code in the Lambda console and test it in the API Gateway console as follows. In the Lambda console, choose Create function. For Runtime, choose Node.js 8.10. Copy/paste the following code into the code editor. // the authorizer returns an HTTP 500 status code. // Note that token values are case-sensitive. In the API Gateway console, create a simple API if you don't already have one. Choose your API from the API list. Enter a name for the authorizer. For Lambda Function, choose the region where you created your Lambda authorizer function and choose the function name from the dropdown list. Leave Lambda Invoke Role blank. For Lambda Event Payload, choose Token. For Token Source, enter tokenHeader. For the tokenHeader value, enter allow. If the token value is 'unauthorized' or an empty string, the authorizer function returns a 401 Unauthorized HTTP response, and the method call fails. If the token is anything else, the client receives a 500 Invalid token response, and the method call fails. In production code, you may need to authenticate the user before granting authorization. If so, you can add authentication logic in the Lambda function as well by calling an authentication provider as directed in the documentation for that provider. In addition to returning an IAM policy, the Lambda authorizer function must also return the caller's principal identifier. It can also optionally return a context object containing additional information that can be passed into the integration backend. For more information, see Output from an Amazon API Gateway Lambda Authorizer. To create a request-based Lambda authorizer function, enter the following Node.js 8.10 code in the Lambda console and test it in the API Gateway console as follows. For Lambda Event Payload, choose Request. Under Identity Sources, add a Header named HeaderAuth1, a Query String named QueryString1, and a Stage Variable named StageVar1. For HeaderAuth1, enter headerValue1. For QueryString1, enter queryValue1. For StageVar1, enter stageValue1. Otherwise, the the authorizer function returns a 401 Unauthorized HTTP response, and the method call fails.